Om. 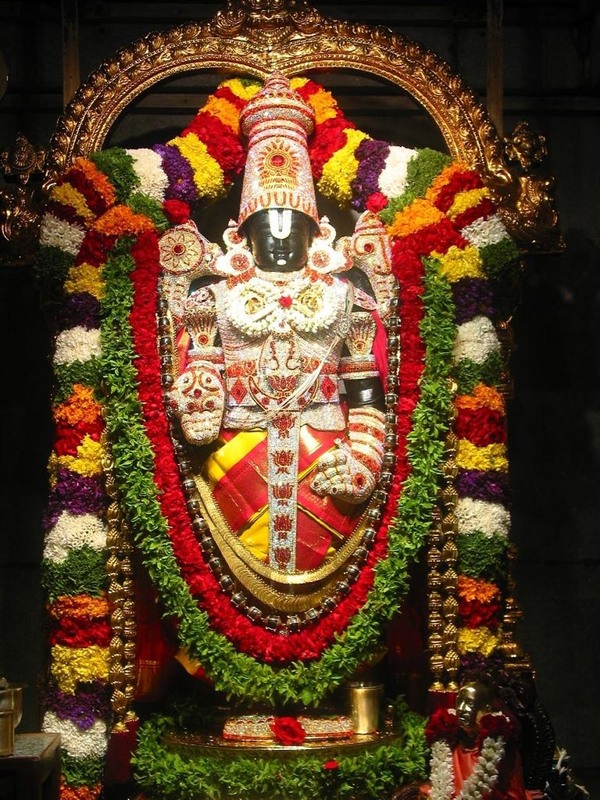 Salutions to the Lord Sri Venkateshwara Balaji ! I generally don't share my personal experiences through this story you will understand why I have openly started sharing my devotion. My husband is a devotee of Balaji. Last summer, after the completion of some work we went to the Livermore, CA, Shiva-Vishnu temple (http://www.livermoretemple.org) to pay homage to Sri Balaji. It was pure coincidence that as soon as we entered the shrine the Aarti started. I was praying in my mind for my son etc. and then I heard His voice say, "And what about your book?". I thought, "My book?!" for me it is the least important thing in my life. (I have written a book on Santana Dharma - "Eternal Way to Bliss".) But I guess it was by my Dharma for spreading Dharma...Anyway. Then I heard Him say something to the effect, "Write your second book on devotion. ON ME!" I heard the thunderous voice with the ON ME! in my mind. Right after the priest shouted, "GOVINDA! GOVINDA!" Balaji is Govind, my Govind? I didn't even know that. Anyway, I thought maybe I was hallucinating. On devotion!? What a lame subject! I was thinking of writing my second book on the practical applications of spirituality and writing it like an Upanishad with question and answer between a student and Guru. What transpired over the days and months that followed is the great clarity on why I should write on devotion. Around Navratri I had gone to India. I wanted to take my mother to a holy place, initially Rishikesh, but it was too far. I did a 3-5hr drive radius check and found Vrindavan-Mathura. Well I've never been there, I should go because I am a Krishna bhakt. And perhaps I can start my book on devotion there on the aupicious day of Dussera. Plans kept changing back and forth and finally my nephew told me, "Bua we are leaving this Sunday and coming back on Wednesday, and no more changing plans!" So with that ultimatum we were set. It was right after that our spiritual guide and nephew's grandfather, Nanaji, told me that Mon. is Sharad Purnima. What! Really? Obviously Krishna wants me to come to Vrindavan on Sharad Purnima - the night the Gopis united with Krishna in the Raas Leela. And guess what - on Sharad Purnima evening I was in Nidhi Van where the Raas took place. Amazing coincidence. On December 23, 2012 it was Vaikunth Ekadasi, Gita Jayanti, in California and again we went to Balaji temple in Livermore. Of course I was waiting for a message what do you think!? I was in the shrine of my beloved Balaji waiting....in deep reverence and love. He said one sentence, "Vaikunth is your heart, and today the doors of your heart are open." Vaikunth is your heart? I pondered over this for several weeks. The Anahata chakra is the door to Vaikunth. Anahath chakra is the only chakra that radiates outward in expansion. So I guess it is through the heart that you reach Vaikunth. The heart doesn't mean the physical heart, it is the central core of our being, the seat of the soul, in the energy center in the middle of the chest, near the physical heart. There is a certain other event that took place as recently as a month ago that revealed my Dharma - the purpose of my life. I've written about it in a blog on SpeakingTree. I realized that my innate nature is that of devotion, Bhakti, it's my role in creation. I have been a Bhakt before as well. I hope you enjoyed reading my story...I hope you will share yours!